The winding pathways past the gate of the resort gave me a feeling of seclusion with clean cut grass that made me feel like royalty. Upon entering, the spiraling staircase led towards the oriental hammam reception. I told reception that the treatment for me was the 80 minute Royal Hammam, which qualified for a wholesome spa experience. What I expected from this visit was to have my skin exfoliated well because I had heard about the hammam by word of mouth. 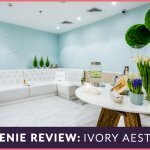 I didn’t have a predisposition about the spa because it was a traditional approach to cleansing and spa treatments so I was in for a surprise. Upon arrival, the receptionist introduced the Moroccan black soap and the honey that would be used for the treatment. The host led me to sit while he brought a towel soaked in rose water and fresh juice to get started on the journey towards pampering. Mysterious doors confused my direction as I shifted from the delightfully serene and spotless waiting room towards narrow and winding hallways that lead from one to another. Finally I was in the locker room to change. The ladies assisted me with my robe and towel, wrapping it so it coincided with tradition. Afterwards, I entered a room full of women where pools of water were rushing down the drains in a marble and tiled room of lights dimmed by lanterns. It gave me a feeling of the rushing serenity that comes from the echoing sound of water. The room was round and spacious, with a marble table in the middle and nooks aligning the confines. The first impression was of exoticism and intrigue. The lady who assisted me was Moroccan and wore a bandana to cover the whole of her hair. She then led me to have a seat and offered me Moroccan tea. She explained that the ritual began with women’s conversations. The tradition of the oriental hammam was for privileged ladies to pamper themselves before marriage by cleansing their bodies, creating an intimate area for women to be free to carry on with activities and spend hours relaxing in their private chambers. It was recommended to wear a swimsuit as I came to find out that it involves immersing yourself in water. The robe was removed by the assistant who sat me down on the concrete bench and turned on the water from the large oval shaped sink where the faucet is kept on and the water is left to pour out and on the floor freely. The water was a warm temperature. The assistant took the pale and dipped it in the sink before pouring it over my head and letting the water rush over me refreshingly. Afterwards I was lead to a steam room for quite a while to open up the pores for proper exfoliating and cleansing. After the steam room, I was soaked then soaped up and taken to the steam room once more. Then thorough washing was carried out, the assistant making sure the soap was all gone. Then I was lead to the marble slab in the center of the room where ladies followed suite around the borders at their own rate. Moroccan black soap is applied to a loofah where intensive scrubbing and exfoliating took place. Once this was done, I was once again absorbed in water to remove any residue that remained. I returned to the marble slab for a traditional body wrap with the eucalyptus scented “Ghassoul” that wasn’t really explained. On the warm marble slab was also where a traditional honey facial took place amidst the massage before the assistant left me to rest alone for a while. Afterwards, a final washing took place. After the treatment was over, my skin felt cleansed and my body surrendered to the world of calm. Wrapped in a towel from head to toe, I lied on a chair in a room outside the hammam where tea and dates were served. The quiet sigh of the relief that comes after a long bath washed over me. I heard nothing but the quiet, utter hum of silence that hypnotized my nerves to subtlety. For those of you who want to try an out of the norm experience for the same, if not higher, result of ultimate relaxation and cleansing, this is the treatment for you! If you’re not convinced, note the fact that the word massage is an Arabic derivative that means ‘gentle touch’ which implies that they must be experts at it! The One&Only Royal Mirage Oriental Hammam Spa gave me an out of body experience.